After spending close to 40 years playing the political game as a municipal staffer, Debbie Sherwood believes she has all the tools necessary to make an effective councillor in Orangeville. In what is her second time running for office in the community, Ms. Sherwood hopes to go one step better than she did in 2014, when she finished sixth with 2,512 votes – 373 shy of a council berth. Discussing that last election with the Citizen, Debbie admitted it hurt to secure the position of first runner-up, but said simply that she was using that to fuel her desire to win a seat amongst what has shaped up to be an impressive group of candidates. 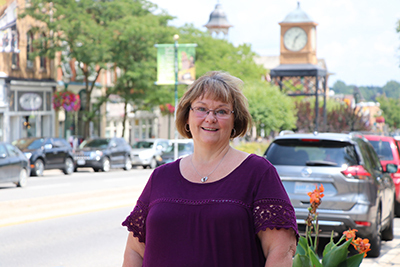 During her lengthy career working for the Town of Orangeville, Debbie served as a certified municipal tax professional. Much of her time was spent dealing with people in the community who were having issues keeping up with their tax bill. As such, she feels that makes her the most qualified candidate to truly try and tackle the community’s issue with “out of control” taxes. It is perhaps fitting, and not at all surprising, then to learn that Debbie’s number one priority should she be elected is, in her own words, re-establishing a sense of fiscal responsibility at town hall. She has watched on in horror over the years as council has approved tax increase after tax increase. Looking closely at some of the numbers, Ms. Sherwood criticized this current council for one of its most recent decisions – the hiring of eight new full-time firefighters to give the community 24-hour immediate service. Her issue wasn’t with the hiring, but with the way this council funded the $800,000 expense. She also took exception to the Town’s five-year plan, which calls for a 20 percent increase in its operating budget by 2022. Which brings us to policing. While she admits she “loves” the Orangeville Police Service, she stated she would have to “think with her head and not her heart” if the municipality was able to save more than $4 million a year by adopting the OPP. As many other candidates have suggested, Ms. Sherwood would like an independent review to be carried out by a third-party consultant to determine, once and for all, if transitioning to the provincial police would be truly beneficial. Regarding other hot-button issues in town, the candidate called for the local railway line to be either decommissioned or sold. Debbie would like to see the town maintain its two libraries, while she acknowledged funding a new fire hall – an $8 million expense slated for 2020 – would be a “want rather than a need” and, as such, council should plan for the expense. She said she was in favour of growth, but only because it’s mandated by the provincial government. An important side task of hers, should she get elected, would be attracting new businesses to town to help lessen the tax burden on residents.